Friday (the week before) — Cheerleaders decorate hallways. Most spirited hall wins a prize. Monday — camo day. Dress in camouflage. Homecoming parade after school. Streets around town are blocked off. Vote for homecoming queen. Tuesday — crazy hair day. Student with the craziest hair wins a prize. Wednesday — 60’s day. Dress like you’re from the 60’s. Thursday — 80’s day. Dress like you’re from the 80’s. Friday — Pep Rally in the Dark at 5AM. This typically is just for the studets. Spirit day. Dress with school spirit (school colors, face paint, etc). 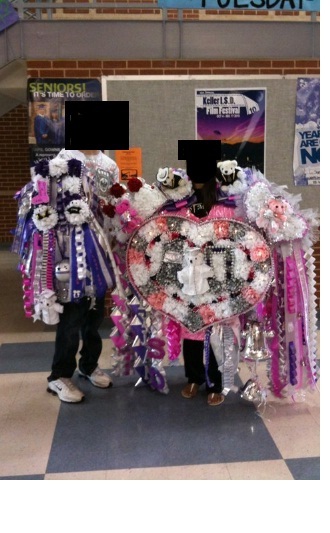 Girls wear mums (gargantuan mums). Boys wear garters usually around their bicep unless it, too, is gargantuan (see picture below). Another Pep Rally. Parents come to this one. Huge pep rally often featuring something silly from senior football players (dress like cheerleaders and do a cheer). Although there is controversy that homecoming began in 1911 at the University of Missouri, one can trace it back to another school two years earlier. In 1909, alumni of Baylor University in Waco, Texas were invited to return to the university to renew old friendships and “catch the Baylor spirit again.” It included class reunions, speeches, concerts, formal dance, parade, and football game. This was the first homecoming. Maybe that’s why it’s a bigger celebration in Texas than northern states. The chrysanthemum (mum for short) was chosen as the homecoming flower because it is notoriously known as the “fall flower.” In 1911, cars were decorated with chrysanthemums at the University of Missouri parade. Although homecoming was created for the alumni to “come home” to visit old friends and show their spirit by attending a football game, it has turned into a week-long celebration by students of all ages in many southern schools. I’ll leave you with a photo from students in my school district. Everything’s bigger in Texas, right? This is Crazy but very much the truth! 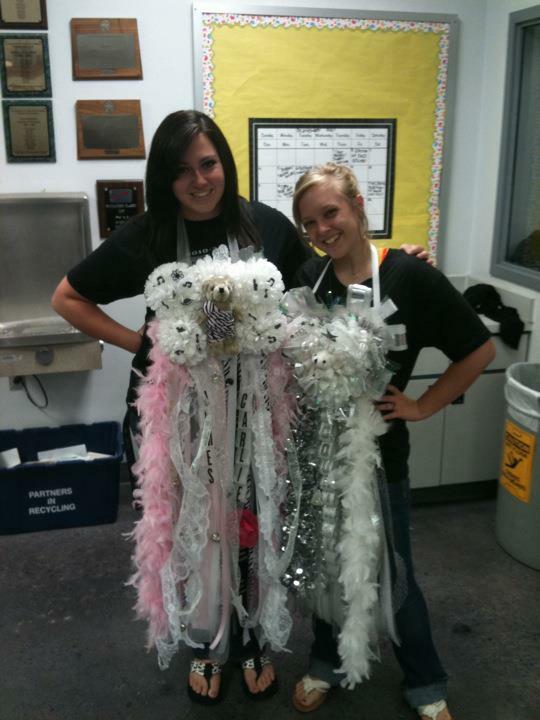 Go DHS Broncos!!!! I am currently just understanding RSS feeds. As I learn, I can give you more information. Sorry I’m not of more help.